Professional sports are an important source of entertainment in many countries, including those in the Arab region. More Arab nationals now than in 2016 say they enjoy watching sports on TV/digitally or in-person at sporting events. Large majorities of Emiratis, Saudis, and Lebanese express enthusiasm for watching and attending sporting events, representing 15 percentage-point increases or more in each country since 2016 in the share of nationals keen on sports viewing. Fewer than half of Qataris, Jordanians, and Tunisians, however, say they enjoy sports—figures similar to those reported in 2016. Around half of Egyptians enjoy watching sports on TV, and four in 10 enjoy attending professional sporting events. Men are more likely than women to say they enjoy watching and attending sporting events, but a sizeable minority of women also enjoys sports (watching sports on TV or digitally: 71% men vs. 38% women; attending professional sporting events: 67% vs. 34%). Younger nationals are somewhat more likely to say they enjoy watching or attending sporting events than older respondents, but still nearly half of the oldest group enjoys watching sports on TV (watching sports on TV/digitally: 59% 18-24 year-olds, 56% 25-34 year-olds, 53% 35-44 year-olds, 48% 45+ year-olds; attending sporting events: 57% 18-24 year-olds, 53% 25-34 year-olds, 49% 35-44 year-olds, 43% 45+ year-olds). Educated nationals are more likely to express interest in sports viewing. 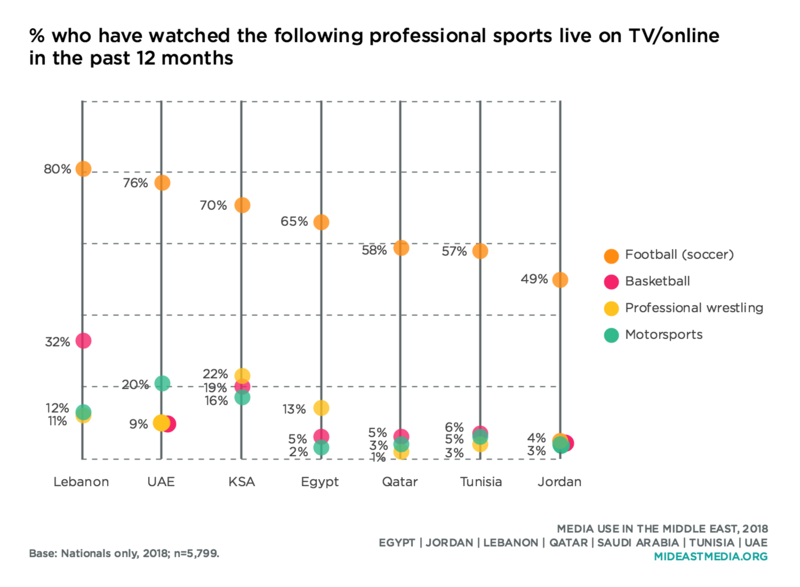 Sixty-two percent of Arab nationals with a university degree or higher enjoy watching sports on TV or digitally compared to just 38% with a primary education or less. And 58% of college-educated nationals enjoy attending professional sporting events versus 30% of the least educated group. More Arab nationals who self-identify as culturally progressive follow sports than self-identified cultural conservatives. Six in 10 progressives enjoy attending or watching sports on TV or digitally compared with half of conservatives (attend: 61% progressives vs. 47% conservatives; watch: 62% vs. 51%). 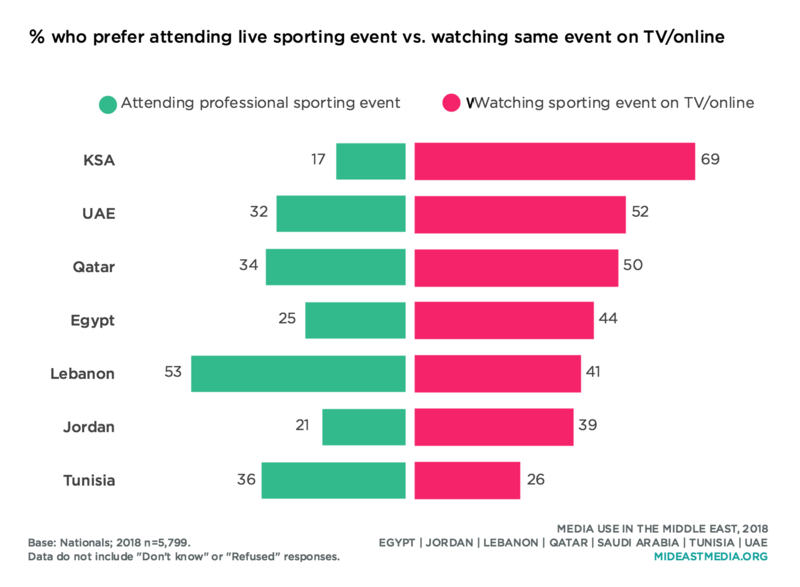 While many nationals say they enjoy watching sports on a screen and also attending sporting events, when presented with a choice of one or the other, Saudis, Emiratis, Egyptians, Qataris, and Jordanians prefer to watch on TV/digitally, while Lebanese and Tunisians prefer to attend the event. Notably though, many Jordanians and Tunisians—fewer of whom express enjoyment of sports generally—don’t express a preference for either (39% and 32%, respectively say they don’t know which they prefer). Such ambivalence from Tunisians is interesting, as Tunisia was among the 32 countries in the 2018 World Cup. 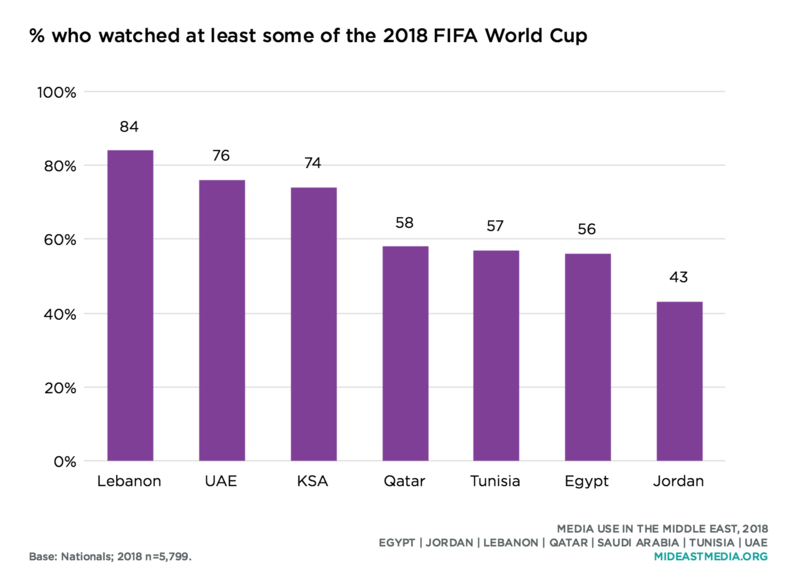 Saudi Arabia was also in the 2018 World Cup, though considerably more Saudis than Tunisians expressed interest in both attending sporting events and watching on a screen. More nationals list sports as among their favorite three genres of TV and online video now than did so in 2016 (TV: 21% listed in top three in 2016 vs. 27% in 2018; online: 15% vs. 22%). Interest in sports as a genre is particularly high in the UAE and Saudi Arabia, where it surpasses news as a favorite genre both on TV and online (sports as a top 3 favorite—TV: 42% UAE, 33% KSA; online: 37% UAE, 29% KSA). 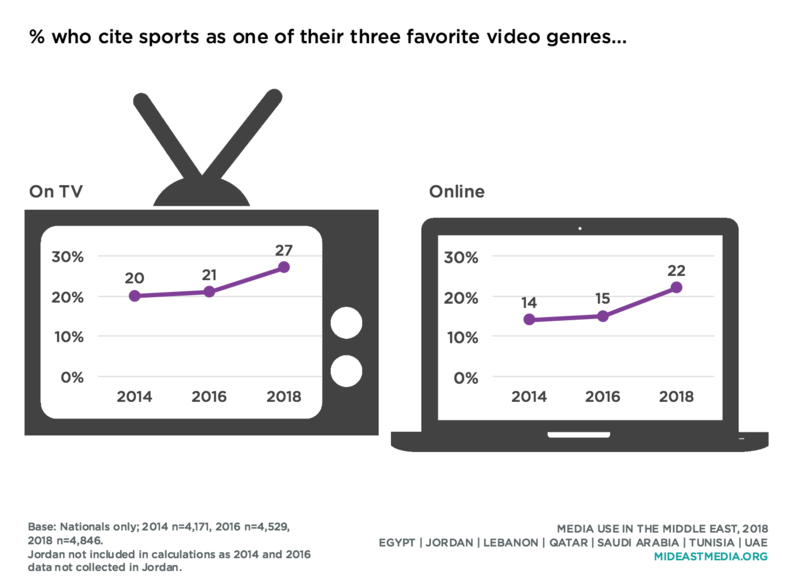 Sports is less likely to be a top-three genre among Jordanians and Lebanese (18% and 16% for TV, respectively; 20% and 12% online). Men are six times more likely than women to name sports as one of their three favorite genres of both TV and online video. Education also plays a role; one in three nationals with a university education or higher lists sports as a top-three favorite TV genre compared to 13% with primary education or less, 20% with intermediate, and 27% with secondary education. Age plays less of a role; fewer nationals in the oldest age group—45 and up—express interest in sports (TV: 30% 18-24 year-olds, 29% 25-34 year-olds, 24% 35-44 year-olds,18% 45+ year-olds; online: 27% 18-24 year-olds, 27% 25-34 year-olds, 22% 35-44 year-olds,11% 45+ year-olds). Football/soccer is by far the most popular sport to watch or attend among respondents in these samples. Most nationals in all countries watched football on TV or online in the past 12 months, ranging from 80% in Lebanon to 49% in Jordan. Measured in this way, no other sport comes close, though other sports did register moderate popularity in some countries. In Lebanon, one-third of nationals watched basketball in the previous 12 months. 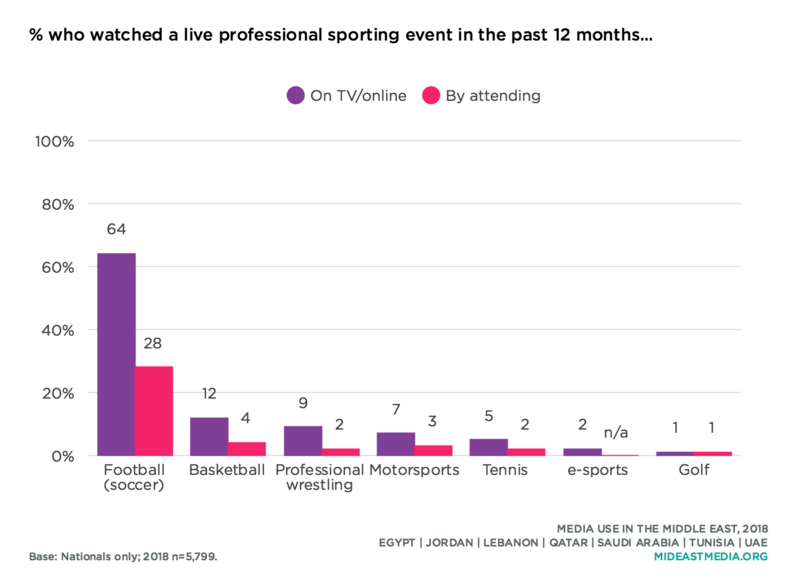 One in five Saudis had watched basketball and professional wrestling and nearly as many Egyptians watched professional wrestling in the previous year. In the UAE, one in five had watched motorsports. In Jordan, Qatar, and Tunisia, however, no sport other than football was watched by a substantial share of the population. Men are more likely to watch football/soccer than women, but while eight in 10 men have watched football on a screen in the past 12 months, nearly half of women have done so as well (81% vs. 47%, respectively). The 2018 World Cup likely influenced frequencies of watching football on TV or online in the prior year, especially as three of the seven countries studied competed in the tournament (KSA, Egypt, Tunisia). Most nationals in all countries except Jordan watched at least some of the World Cup (84% Lebanon, 76% UAE, 74% KSA, 58% Qatar, 57% Tunisia, 56% Egypt, 43% Jordan). The 2018 World Cup was widely popular in Arab countries surveyed here. Among nationals in all seven countries, eight in 10 men and nearly half of women watched at least some of the World Cup (80% vs. 46%, respectively). Two-thirds of nationals under 45 and half of those 45 and older watched (67% 18-24 year-olds, 66% 25-34 year-olds, 65% 35-44 year-olds, 53% 45+ year-olds). Seven in 10 of nationals with a university degree watched the World Cup, as did 66% with a secondary, 58% with intermediate, and 40% with a primary education or less. Attending sporting events varies widely by country. Nearly half or more of Saudis, Tunisians, and Emiratis attended at least one sporting event in the previous 12 months (58%, 56%, and 47%, respectively). Comparatively fewer nationals had attended a sporting event in Qatar, Jordan, or Lebanon (41%, 27%, and 27%, respectively). Sporting event attendance is considerably lower in Egypt than in other Arab nations, as fewer than one in ten Egyptians had attended any live professional sporting event in the past year. Live football attracts more attendees overall in these seven countries than do other professional sports. More than four in 10 Saudis, Tunisians, and Emiratis attended a football match in the previous 12 months (46%, 46%, and 42%, respectively) compared with 33% of Qataris, 21% of Lebanese, and 19% of Jordanians. No other sporting event was attended by more than 10 percent of nationals in any country. In Egypt, only 5% said they attended a football match in the past year. Men are more than twice as likely as women to have attended a football match in the past 12 months, though nearly one in five women did so (39% vs. 18%, respectively). One third of nationals under 45 years old attended a football match in the past 12 months compared with one-fifth of those 45 and older (31% 18-24 year-olds, 33% 25-34 year-olds, 28% 35-44 year-olds vs. 20% 45+). Attendance differs by education level. Approximately one-third of those with a secondary education or higher attended a football match in the previous 12 months, compared to just one-fifth of nationals with less than a secondary education (32% university or more, 31% secondary, vs. 21% intermediate and 16% primary or less). 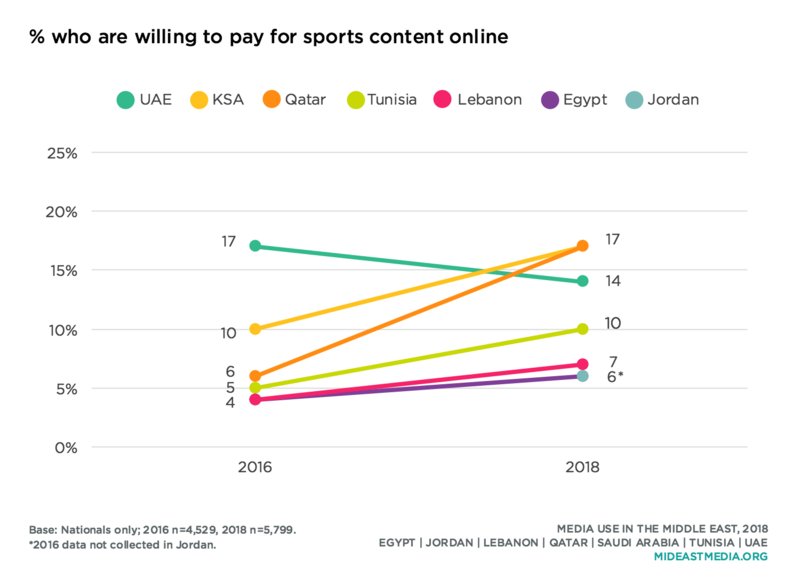 While Arab nationals are somewhat reluctant to pay for any online content, they are more willing to pay for sports and films than other content (10% and 9%, respectively). Willingness to pay to pay for online sports content increased among nationals between 2016 and 2018, as did the share of respondents who said they paid for online sports access in the prior six months. Qatar and Saudi Arabia saw the largest increases in willingness to pay for sports online, from 6% in 2016 to 17% in 2018 in Qatar and 10% to 17% in Saudi Arabia. Fewer internet users in Jordan, Egypt, and Lebanon expressed willingness to pay to access sports online—6%, 6% and 7%, respectively. Men are far more likely than women to both watch sports online and to have paid for it in the past year (willing to pay: 17% men vs. 2% women; have paid: 13% vs. 2%). Consistent with a greater general interest in sports viewing, more respondents say they share content or comment on sports online. Arab nationals are twice as likely in 2018 than in 2014 to have sent, shared, or posted content or comments online related to sports in the prior month (9% in 2014 vs. 19% in 2018). Men are much more likely than women to have posted about sports in the past month (31% vs. 5%, respectively). And those under 45 years of age are far more likely to have posted about sports compared to those 45 and up (21% 18-24 year-olds, 23% 25-34 year-olds, 17% 35-44 year-olds,10% 45+ year-olds). Fitness habits vary widely across countries. 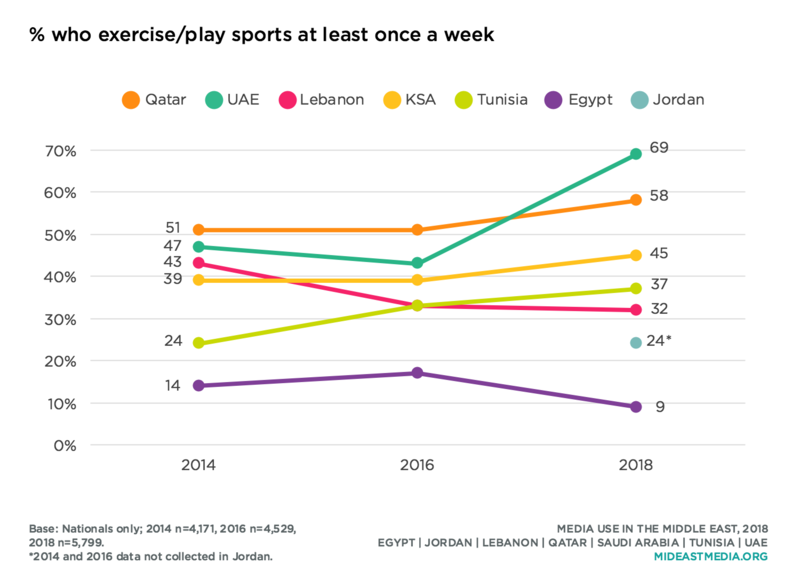 Large majorities of nationals in all countries except Egypt and Jordan say they exercise or play sports at least sometimes, but regular participation—at least once a week—varies from a low of 9% in Egypt to a high of 69% in the UAE. Physical activity also varies widely by demographics. Men are more likely than women to engage in physical activity at least once a week (39% vs. 25%, respectively). Additionally, exercise is far less common among older respondents; around four in 10 nationals 18 to 24 years old exercise or play sports at least once a week, while only 16% of those 45 and older do so. Education also plays a role. Nearly half of those with a university degree exercise or play sports weekly (46%). This drops to 34% among those with a secondary education, 18% with an intermediate education, and 9% of those with a primary education or less.